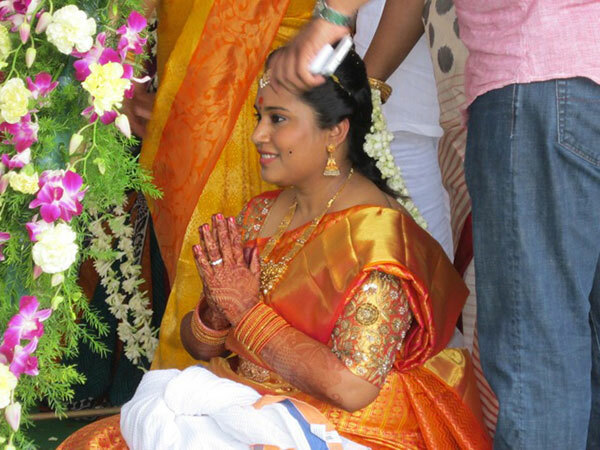 An unexpected invitation to a wedding in Hyderabad developed into a memorable experience. 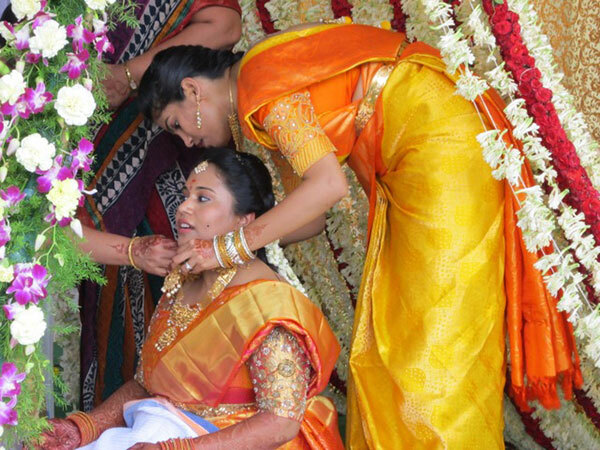 Here is a little insight to the colours, culture and atmosphere of a traditional Indian wedding. When we received the wedding invitation, just three weeks before the actual event, we vacillated, uncertain, not sure we even wanted to visit India. However, encouragement from the bride Ashwini and friends, particularly one who had attended an Indian wedding, and one who had been invited to an Indian wedding and didn’t go, spurred us on to just do it. Getting Indian visas, purchasing clothing to suit humid, monsoon weather, digesting information provided through Ashwini and travel information sources, obtaining malaria medication, rushing out to review the movie The Best Exotic Marigold Hotel 2 all kept us in a high state of activity. Suddenly and unbelievably, there we were, at Hyderabad International airport, amid masses of people, and there were Ashwini and her fiancee, Landon, warmly welcoming us to India. 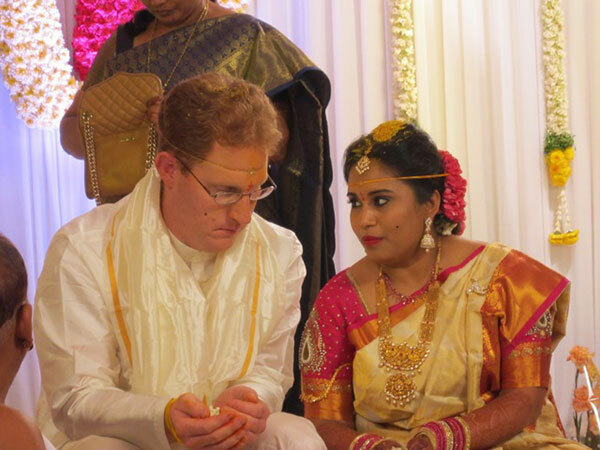 There began a whirlwind week of exotic sights, sounds, and tastes – we were gently immersed in traditional Hindu wedding celebrations, enfolded within a generous and hospitable family support system, and surrounded by a gregarious group of new international friends. We were accommodated in an apartment provided by the family, together with German and American friends of the bride and groom. We had our own en-suite bedroom, and shared lounge and kitchen facilities, which meant we quickly developed friendships and never felt alone within a different culture. Each day was planned for us and packed with activities and functions to attend. While we enjoyed air conditioned surroundings much of the time, we explored the city in hot, humid temperatures; when monsoon season began, sudden downpours of torrential rain came with it, cooling the air. In India there are times of the year which are seen to be most auspicious for getting married, and in these times, weddings are prolific. This, aptly, is the ‘wedding season’. And when we arrived in India, the wedding season was in full swing. Indian weddings are filled with ritual, tradition and celebration that continue for several days, and for Ashwini and Landon, this certainly was the case. Ashwini was born in India, but had attended university and worked in USA for many years, and this was where she met Landon. It was their decision to marry, which is less usual in India, where to this day the majority of marriages remain arranged by families. Our first day in India was spent visiting a local shopping centre with new friends, and checking out clothes to wear to the wedding. While I had a suitable gown to wear, two of the women we were sharing with did not, and were intent on purchasing a sari. It was a fascinating experience to see the customs and glamour associated with the purchase of a sari. Watching metres of shimmering fabric being carefully folded into an elegant gown gave me a sense of awe; now when I see sari-clad women, I marvel at their skill in assembling such a garment. The shopping centre was clearly up-market, with security screening on entering, and a fascinating exotic array of items for purchase. That evening many of the family and friends gathered at a dinner provided by the bride and groom at a local five star hotel. We so enjoyed the sumptuous gourmet smorgasbord of Indian foods. The second day was Landon’s bridal shower, held at a green and lush spa resort. 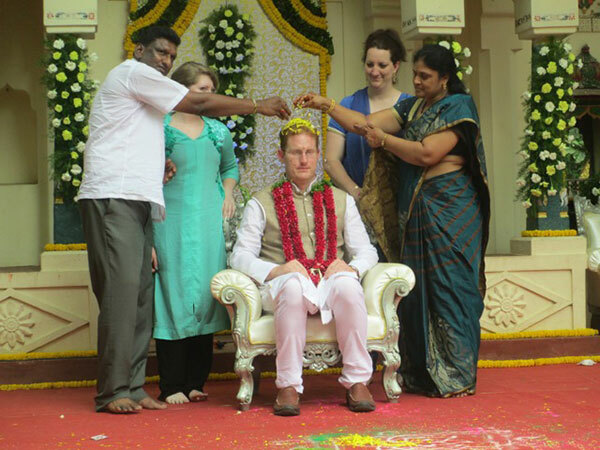 Unlike our Australian bridal showers, this was officiated over by a Hindu priest and attended by family and friends. The ceremony occurred outdoors, on a platform brightly decorated with fresh flowers, including orchids, roses and marigolds. Landon was adorned in garlands of flowers and dressed in traditional white Indian trousers, long jacket and beige waistcoat. During the ceremony, he was pasted with turmeric powder, showered with rice, and dusted with many coloured powders, and looked not unlike a living rainbow by the time it was all finished. Guests presented him with numerous offerings of tiny bananas (symbolising baby boys) and rounded leaves (symbolising baby girls). It was a relaxed and fun time, with plenty of time to get to know guests, and wander around the beautiful resort gardens. 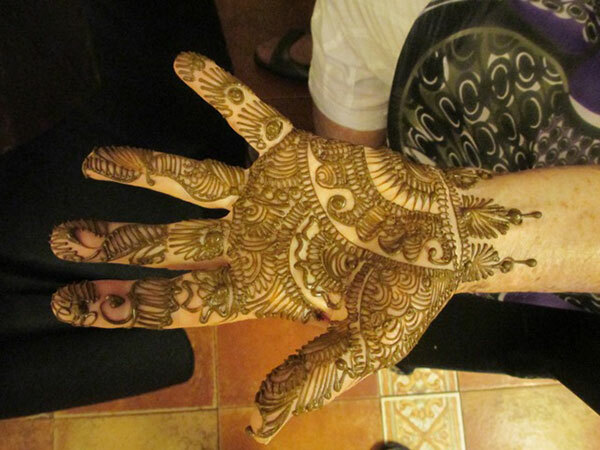 A henna ceremony was held there later in the day, with female guests invited to have their hands and feet hennaed. The bride’s henna was both intricate and beautiful, signifying the strength of love in the marriage. Lavish feasts were provided for breakfast, lunch and dinner. The third day commenced early as we celebrated Ashwini’s bridal shower, held at her parents’ spacious home. The house was elaborately decorated with thousands of flowers, and a group of musicians provided a boisterous backdrop to the celebration. We commenced with an entertaining bangle ceremony, around a table laden with glass bangles of every colour imaginable, and guests were invited to choose bangles to match their wedding outfits. Like the previous day, the priest then officiated over a lengthy ceremony of ritual and symbolism. Ashwini looked beautiful, poised and calm, wearing yet another stunning sari (this time, orange and gold), lavishly studded with jewellery, and with fragrant flowers adorning her long dark hair. A massive feast was provided for lunch, and we rested in our apartment before the evening wedding ceremony. 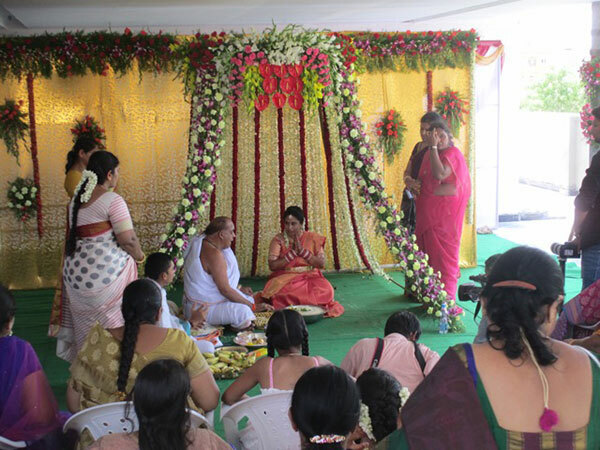 The wedding ceremony was held over several hours, at a sumptuous five star hotel. I felt very emotional, absorbed in a vibrant evening of ritual, music, floral abundance and multitudes of guests. Overriding everything was the love between this young couple. Ashwini wore an elegant gold and red sari, heavily embroidered and bejewelled, with glittering gold jewellery, red and gold bangles encircling her arms, and red flowers entwined in her hair. Landon looked handsome and imposing in a white satin suit, with a gold and white scarf. We were impressed with how splendid they both looked, and commented on their poise, solemnity, and tranquility (or so it appeared even after days of exhausting celebrations). Because Landon does not understand a lot of the Indian language, every step was carefully explained by either Ashwini or her family members. 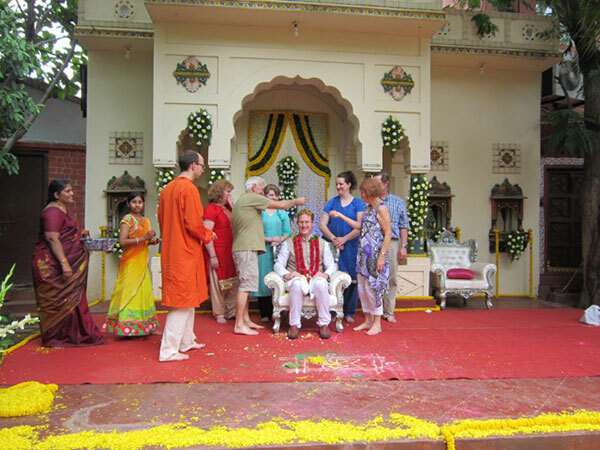 Landon’s family were treated with honour and respect as the two families were joined as one, a tradition in Indian wedding ceremonies. 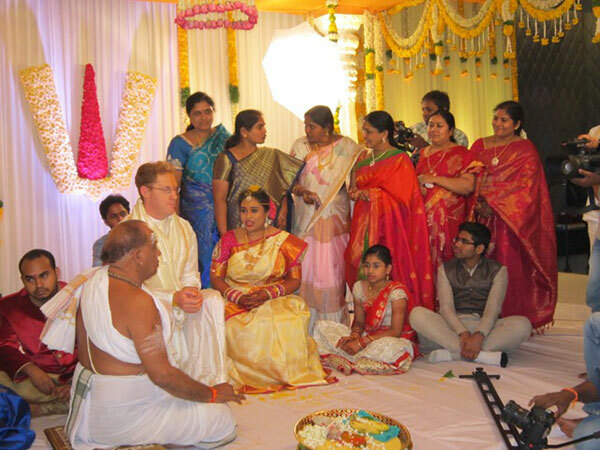 Ashwini and Landon exchanged vows, agreeing to be companions forever, and they were joined with the tying together of scarves, symbolising their eternal bond.They were showered with blessings of flower petals, rice, and turmeric, and all guests had the opportunity to proffer their individual blessings to the happy couple. A beautiful part of the ceremony was where the bridal couple dipped their hands into containers of rose petals and showered each other with these until the petals piled high on the ground around them. The fourth day onwards was time for the families to be together, so we took advantage of the cars and drivers made available to us and decided to see more of Hyderabad. Hyderabad was once the seat of powerful and wealthy Mughal dynasties, and has always been renowned for its opulence. Centuries-old Muslim quarters and architectural gems abound, with ornate tombs, mosques, palaces and bazaars tucked quietly behind every corner. Today Hyderabad is the seat of India’s software industry, generating jobs and wealth for its citizens. However, we also saw many people living in poverty on the fringes of society. Hyderabad is a city of vibrancy, noise, colour and chaos, with people, tuk tuks, cars, trucks, cows, dogs and the odd pig vying for space on congested roads, intermingling and crowding narrow streets. But we found it to be surprisingly seductive and intensely fascinating – any trip away from our comfortable accommodation became an adventure. We found we were swamped by local people who were not used to seeing foreigners in their city, wanting to photograph us and talk to us. They were so friendly and welcoming we felt like honoured celebrities. We visited the sixteenth century Golconda Fort where the massive gates were studded with iron spikes to obstruct war elephants; the dazzling Chowmahalla complex of four palaces boasting nineteen enormous chandeliers made of Belgian crystal; Ramoji Film City, an 800 hectare movie making complex with a dazzling Bollywood display of dancing, music and costumes; the dramatic and towering 16th-century Charminar Mosque, and the surrounding bazaar with every type of goods available. I loved the fabrics, bangles, and perfumes, and couldn’t resist purchasing some pearl jewellery for back home. 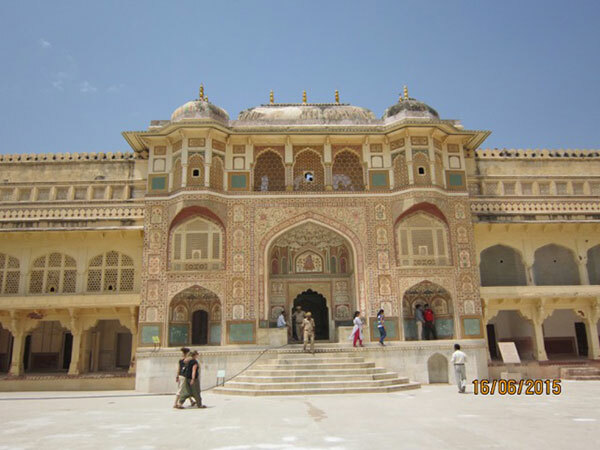 We stayed in Hyderabad for one week, then flew to Jaipur in Rajasthan for a few days to be wowed by hilltop forts and glorious palaces, bargain-filled bazaars, and the history and traditions that linger in India. 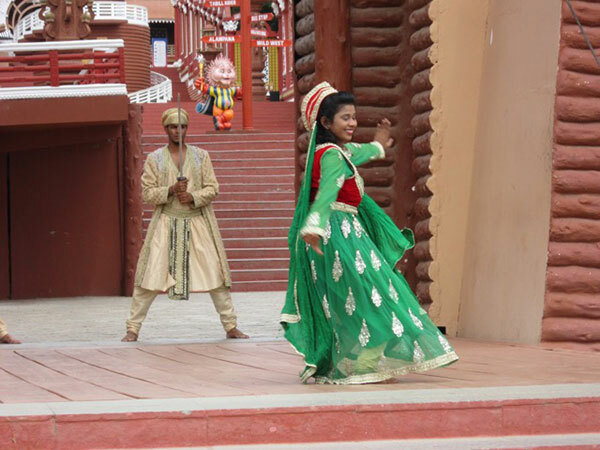 We had a magical evening out at Chokhi Dhani, where we were absorbed by the traditional dance, dazzling costumes, and historical memorabilia of this region, dining on authentic and sumptuous Rajasthani food. My husband had a suit made in Jaipur, by R. S. Tailors, who were recommended to us, and he is delighted with the result. I visited the numerous local jewellery shops and added to my stash purchased in Hyderabad. 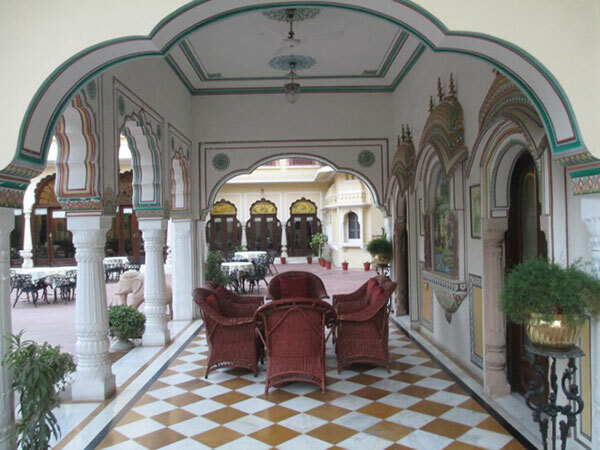 We stayed in the Alsisar Haveli hotel, a beautiful building converted from a maharajah’s palace, where we enjoyed spacious rooms and green gardens. The swimming pool was very welcome in even steamier temperatures than we experienced in Hyderabad. 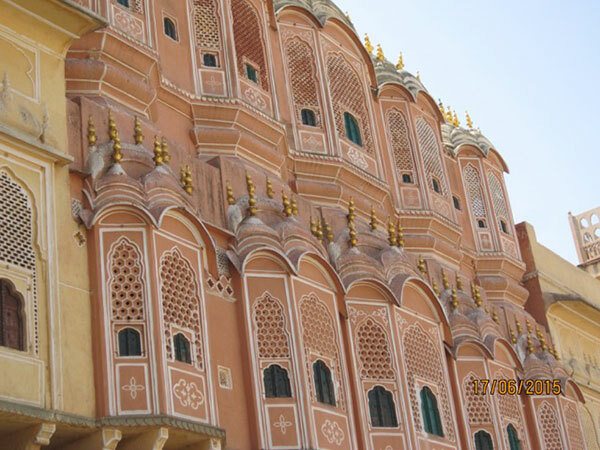 To us it was an oasis in the midst of the mayhem that is Jaipur. While there we travelled by tuk tuk – hot, dusty, occasionally scary, but very authentic, and lots of fun. All too soon we were flying home once again. For us it was such a privilege to be invited to a traditional Indian wedding, and to be treated as an honoured guest. This is definitely a time my husband and I will not forget. For more galleries be sure to check out our Real Weddings page.